Switzerland is well known for its comprehensive public transport system - one of the best in the world - incorporating trains, buses, boats, lake steamers, funiculars and cable cars. The main entry points for international travelers to Switzerland are the airports of Zurich-Kloten and Geneva-Cointrin. Most major airlines from all around the world offer direct or connecting flights to at least one of these two airports. Basel-Mulhouse, Switzerland's 3rd largest airport also is receiving daily international flights, but on a smaller level. 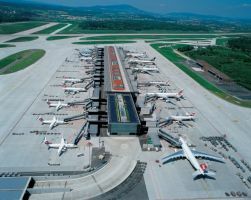 The Bern-Belp and Lugano-Agno airports are rather small and offer just a few daily international flights exclusively to European destinations and/or often connecting in Zurich or Geneva. Travelers to destinations in the south of Switzerland (Ticino or Valais) might want to consider flying to/from Milano-Malpensa in Italy, which is situated just an hour by train or car from the Swiss border. Finally, the Sion Airport has few international flights (e.g. to/from London during winter season) but mainly serves smaller planes - business and private jets as do the regional airports of Gstaad-Saanen or St. Moritz-Scuol. With its central location within Europe, Switzerland always has been an important center of international transportation. Major routes north-south as well as east-west connect through Switzerland, and international fast trains such as the ICE or the TGV stop in all larger Swiss cities several times daily. Also getting to Switzerland by road is simple, since the major European highways connect to the Swiss "Autobahn"-network. Main entry points are Basel and Kreuzlingen in the north, St. Margrethen-St. Gallen and Buchs-St. Gallen in the east, Geneva in the west, and Chiasso-Lugano in the south. When coming from the South (Italy and France) or the east (Austria) it also is possible to enter Switzerland on one of the mountain roads. You can also travel to Switzerland by boat: along the Rhine River all the way from Amsterdam, from Germany via Lake Constance, from Italy via Lake Maggiore or Lake Lugano, and from France via Lake Geneva. 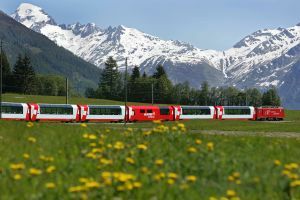 Trains are the most popular way to travel in Switzerland, and Swiss and European Rail Passes make train travel affordable. The transportation network covers more than 5,000 km (3,105 miles). It is difficult to overstate how good this network is: you can get anywhere you want quickly, easily and relatively cheaply and everybody relies on it as a matter of course. Swiss trains are clean, on time and frequent. Post buses are supplementing the train network and their stations are next to railway stations. The main entry points for international travelers are the airports of Zurich-Kloten and Geneva-Cointrin, both major hubs with train stations right at the airport. Traveling by train with a Swiss Rail Pass also allows for lake steamer cruises on most of the mayor lakes in Switzerland, and finally, you can rent a bicycle at all main train stations. >> more information about traveling by train in Switzerland, including scenic trains, ticket options, online booking and sample itineraries. Switzerland has a well maintained network of highways and streets. It is easy to find your way since both highways and streets are clearly marked. The mountainous terrain can make for some circuitous routes and the compensation of superb - if sometimes hair-raising - mountain scenery. To make driving in the Alps easier and faster, there are several long tunnels through the mountains such as the St. Gotthard Road Tunnel or the St. Bernard Tunnel, and in some places one has to put the car on a car transporter train (e.g. Loetschberg connecting the Bernese Oberland and the Valais or Vereina in Graubunden connecting the Davos region with the Engadin Valley). Note that there are only two alpine expressways (A2 St. Gotthard and A13 San Bernardino), while there are lots of pass roads with low speed limits due to hairpin curves. Besides, not all pass roads are open all year (often closed during winter months). Switzerland is a small country: maximum north-south length is 220 km (140 miles) and an east-west length is approx. 350 km (220 miles). Therefore, basically from any place ins Switzerland , any Swiss destination is reachable by car within one day (even St. Moritz from Geneva which is about 465 km (miles). See List of Distances between various Swiss destinations. There are rental car agencies in most sizeable towns and at all airports. Renting a car to travel around Switzerland is easy and fun; it is recommended for travelers that wish to be independent.